These days, Air Force Maj. Thomas Mahoney is attending the Army’s Command and General Staff College. He’s one of a handful of Airmen each year who attend a sister Service’s school to learn more about the culture and operations of a different military branch. "I’m proud of our country and proud of everybody that I serve alongside of." Tom has come a long way from the young man he describes as “not what you would call a stellar student.” It’s a transformation he’s been working on his entire career. As high school graduation neared, Tom realized his academic record would keep him from applying to colleges. He knew he wanted to continue his education, however, and started to look for an opportunity to prove himself. He found inspiration in his family’s military history and then, after speaking with a few recruiters, he joined the Air Force, which he felt was the best match for his goals. During the enlistment process, Tom took the Armed Services Vocational Aptitude Battery test and was matched with a career field. Tom served for five years in that capacity, gathering and organizing information to help his commanding officers make important decisions. When his term ended, he felt he was ready to return to academic life and was accepted to Penn State University. He wasn’t finished with the Military, however. Tom approached the Penn State ROTC detachment with a letter of recommendation from his former squadron commander. After passing the qualifying exam, Tom was accepted into the school’s ROTC program as a general military cadet. He found the experience similar to Basic Training in some ways, but with more of a focus on leadership, history and military customs and courtesies. Tom also attended technical school, where he studied various intelligence disciplines and prepared to lead enlisted Airmen in his field. Combined with his own experience in the enlisted ranks, this training prepared him for life as an officer — and beyond. 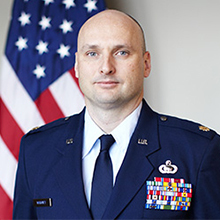 When Tom re-entered the Air Force as a second lieutenant, he was placed in charge of 30 service members, and the success of their missions became his responsibility. As an intelligence officer, that meant piecing together the information gathered by his team into a coherent picture that could guide future operations. He enjoyed analyzing data and interpreting it, knowing his opinions and insight were valued. Tom also found pleasure in leading a very smart group of Airmen. As a major, Tom’s day starts early. By 7:00 a.m., he is often at work compiling information for his commander. After that, he focuses on more long-term initiatives and in-depth analyses of specific issues or events that the commander has identified as concerns or interests to the Military. He also spends part of each day dealing with personnel issues, doing performance reports or making sure his team’s needs are attended to. And that’s just in the office. Tom has deployed recently to Iraq. From his enlisted term to the present, Tom has never stopped working to better himself and the people he leads — a trait that has led him to his current experience at the Army’s Command and General Staff College. No doubt he will return with the knowledge he has gained there and tackle the next challenge with enthusiasm. After all, that is what has taken him from a young man uncertain about his future to a confident leader. And he wouldn’t have it any other way.